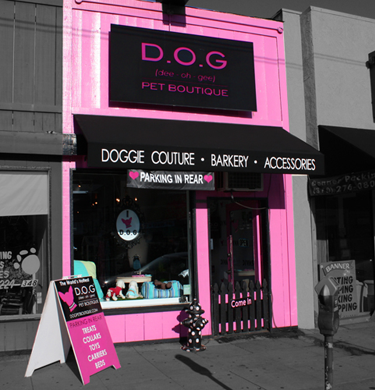 Founded by Chris Price and Christian Velasco - and built on a foundation of love for their pets and stylish fashion, D.O.G Pet Boutique is a retail store located in trendy Los Angeles, offering the hottest pet clothing, accessories, and dog furniture. D.O.G aims to provide a fun and pampering shopping experience for dogs and their dog loving owners. In just a few years, we've grown from just a retail store on La Cienega Blvd. to a world known doggie boutique catering to pampered pets, A-List Celebrities, and even Royalty! It was just meant to be… Co-Founder Chris Price, a retail manager from Los Angeles was on a search for a dog when he found out a 1 year old Chihuahua-Mix named Bailey was available for adoption, he didn't hesitate to rescue him. Never owning such a small dog before, Chris set out to find the perfect products for his new furry best friend. They both were on a mission to find these products all over the Los Angeles area, but they had no luck! He found a few good items online, but he had to look through hundreds of websites just to find them. Soon Bailey had a collection of the hottest dog items from the trendiest clothes, modern collars, to the most luxurious dog beds. Everyday people would say to him "I wish I had that for my dog! ", thats when D.O.G Pet Boutique was born! After coming up with a concept for the new boutique, Chris consulted with Christian Velasco, a website developer from the inland empire. Christian fell in love with the idea and became a partner in the new venture. They both are very creative individuals with a great eye for design and quality. Every product brought into D.O.G has to be fully guaranteed by the designer. Most of the products in the store are designed and manufactured in the USA. Their main goal is to offer exclusive products that will bring both the dog and owner years of use and joy! Unlike many of the big box stores, They truly work hard to keep you and your pet happy! Flash forward to today: Chris and Christian have grown D.O.G Pet Boutique to one of the most popular dog boutiques. They have been featured in many magazines like star, british vogue, people, and cosmopolitan. They are also the first Pet Store to partner with MTV Networks VH1 for a national promotion for their DIVAS show featuring Miley Cyrus and Kelly Clarkson. They cater to many A-List Clients like Adele, Eva Longoria, Carrie Underwood, Charlize Theron, Anne Hathaway and many more. 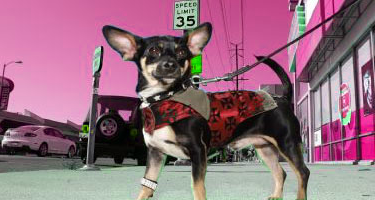 You can find D.O.G Pet boutique on many reality TV shows and news programs like E News, Fox News and GMA. They have received international exposure from many magazine and news outlets in Australia, Japan, Mexico and most of Europe. They became the IT place to pamper your pet. Since D.O.G Pet Boutique's inception, the business is growing steadily, expanding from just a brick and motor retail space on La Cienega Blvd. to a full e-boutique offering unique and exclusive products available for dogs all around the world! Christian is the creative force behind D.O.G, while Chris runs the business side as CEO. Most importantly Bailey is the to TOP D.O.G! He is in charge of what product gets to hit the shelves and which ones don't. Here at the office we named him Bailey Lagerfeld, because he is very picky and knows what he wants! It's hard to believe that this little rescue dog is changing the way people pamper their pets.